In our annual Hangout Handbook, Exclaim! asks some of our favourite artists to discuss their favourite hometown haunts. 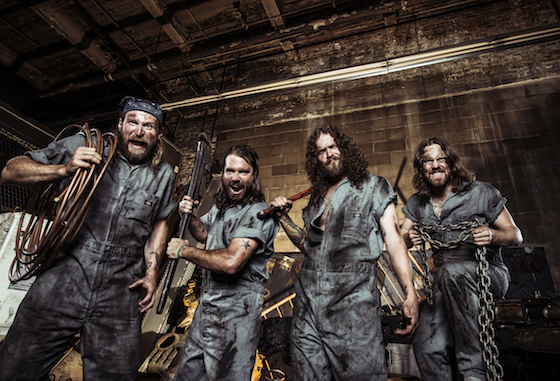 Here, Jon Harvey, singer and bassist of Monster Truck, outlines his picks for Hamilton. The number one place for a sit-down breakfast is the Aberdeen Tavern (432 Aberdeen Ave.). It's a bit fancy, but the food and atmosphere reflect that. Get there early and eat a scone with homemade jam before the church-folk come in and eat them all. In a city as green as Hamilton, there are tons of hiking trails and lookout points to enjoy a relaxing day in beautiful nature. All the public parks are well maintained and have tons of room for activities. The public pools at a lot of the parks have a real Sandlot feel, and in my younger days, we used to love hopping fences after the bar. First Choice Isn't the One Named After You? For lunch I like to go to The Ship (23 Augusta St.). They have awesome burgers and great atmosphere. About a block away is taco joint Mezcal (150 James St. S). They even have a Monster Truck taco as a special from time to time. I don't do much shopping but James St N. and Locke St. are good places to start for hometown and handmade. Dr. Disc (20 Wilson St.), Cheapies (67 King St. E.) and Revolution Records (166 Ottawa St. N.) are the places I buy vinyl at home. If you're into textiles and antiques, Ottawa St. is our city's hub. It's technically in nearby Dundas, but Quatrefoil Restaurant (16 Sydenham St.) is a definite cut above. The cuisine is constantly mind-blowing, and the decor and atmosphere are very clean. It is fine dining, so don't wear cutoffs. Club Absinthe (38 King William St.) is always raging even if it's not too full. If you wanna relax, I suggest Baltimore House (43 King William St.) or The Brain (199 James St. N.), even though they are raging a lot of the time too. If I'm out with buddies, we usually go to Doors Pub (56 Hess St. S.), which is the only exclusively metal bar in Hamilton. I'd say the biggest surprise, due to our lack of venues, is the amount of amazing musical talent our city has spawned (Arkells, Terra Lightfoot, the Dirty Nil, Whitehorse, etc.). We have tons of international acts that either grew up or cut their teeth here, which makes for awesome parties, and great hangs with lots of interesting and creative people. It's the best. Jon Harvey is the singer and bassist for Hamilton rock band Monster Truck. Their most recent album, Sittin' Heavy, came out on Dine Alone earlier this year.